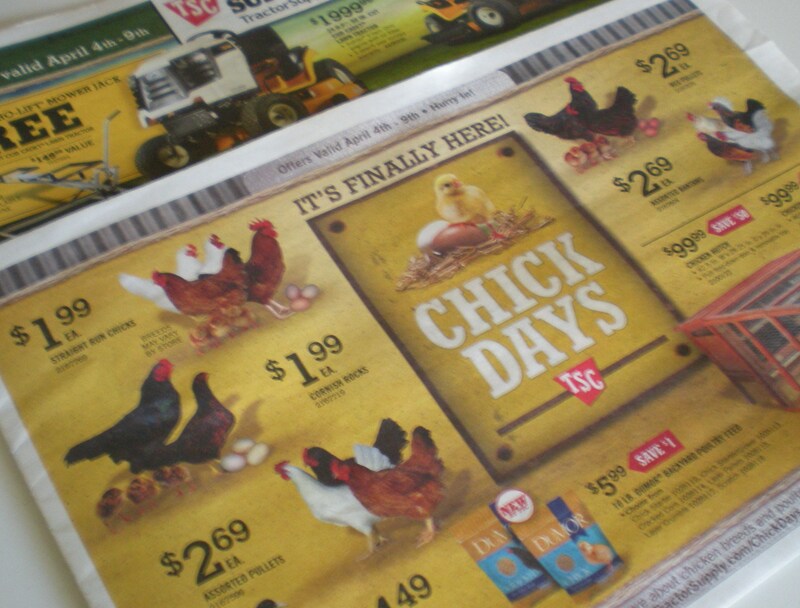 This weekend is baby chick weekend at Tractor Supply. The ad came in the mail the other day. Last year was the first year we were up there when the pens full of little fuzzy ones were set up in the back of the store. You have to buy a minimum of six. You also have to give them information when you check out. I took a couple of pics but they weren’t clear enough to post. I know that some people believe the chicks are there for Easter pets, but they aren’t. There are pullets if you want egg layers and there are also meat chickens. There were four black wyandottes left. I really wanted to buy them, but I need a sturdy coop to keep the fox from getting to them. Maybe next year. Tractor Supply was hopping today. Lots of folks buying seeds and plants. Trailers, too. And, lots of equipment being demonstrated. I buy much of my bird seed there, too. They have the best prices for basic seed, and not a bad price on the shell free seed that I put up near the patio. Don’t want husks up there. 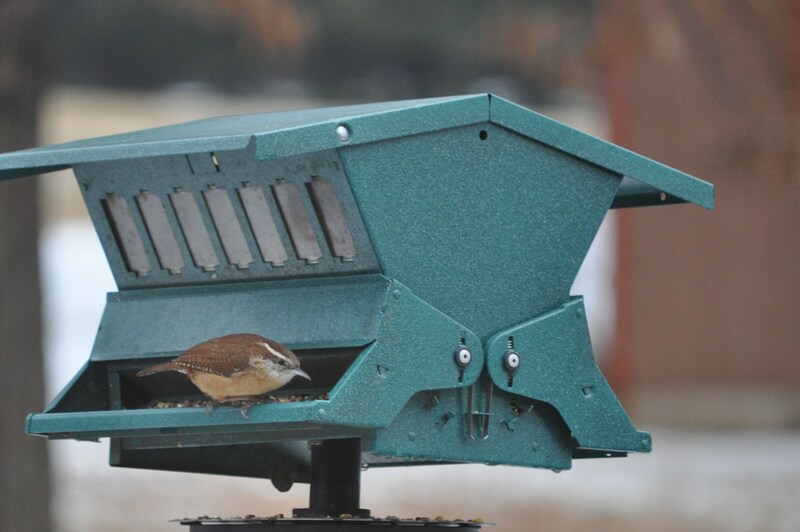 Particularly, since the birds like to shove things off to get to their favorites. 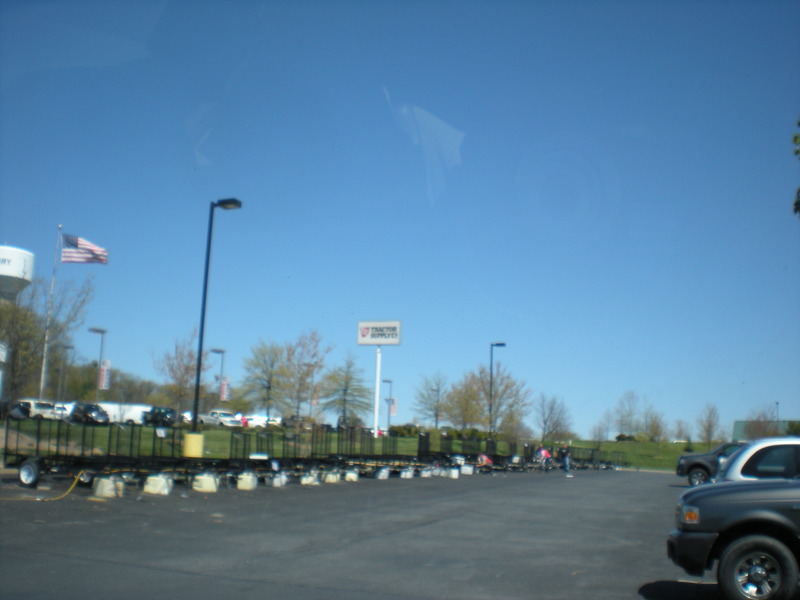 Saturday at Tractor Supply. A West County destination. Posted in Birds, Community, Howard County, Local Businesses, West HoCo and tagged birds, community, hoco loco, Howard County, local businesses, West HoCo. Bookmark the permalink. My good friends at Buckland Farm (a farmstay B&B about 2.25 hours from Columbia, Md.) got Wyandottes as their first chickens. I was up at the farm the day they arrived at the post office and got to experience their out-of-the-box welcome to the world and watching them grow up. They had really good luck with them and had a 100% survival rate. Love the chick video. I had to go to the PC to see it. The iPad of course has its issues with videos. The piglets are adorable at that size. We want 4-5 chicks when we do get them. We are going to have neighbors keep an eye on them if we go away, in exchange for eggs. Have other friends who will barter for eggs as well. I like the B&B, too. We have to check them out.